Card weaving, also called tablet weaving, is a technique I have worked with for many years. The process involves 4"x4" square cards with holes in the center through which threads are pulled. As the cards rotate, different threads come to the top and a weaving shed is created. This deceptively simple setup can produce complex woven structures and patterns. The rotation of the cards also causes the warp threads to twist, which reflects light and causes the fabric to undulate. 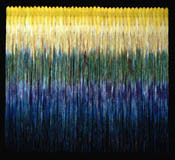 In my most recent work, dyeing has become a major part of the visual statement. I begin with different neutral yarns, prepare warps, then use indigo and fiber reactive dyes to color each thread. After the dyeing is complete, I thread the cards. Each band is woven separately. Light #2 consists of 43 doubled bands for a total of 86 individual sections. The complexity that comes from color, weave structure, and pattern changing from band to band, builds a whole that reminds me of light playing on a landscape at different times of the day. I have been studying Kuba patterns for many years and have a small collection of traditional older fabrics from this area. The Kuba are part of the African country that has been called Zaire, the Congo, and the Republic of Congo. 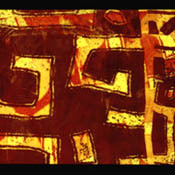 The patterned images of the Kuba incorporate simple geometrical shapes in a variety of repeats. The textiles are embroidered with raffia on a woven raffia ground. I am fascinated by how these images build, interact, and multiply. There is a spontaneous and improvisational quality to how the pattern develops and covers the raffia fabric. I took elements of their patterns and their overall concept of pattern variation and worked with these ideas in my own way. I used a completely different fabric, a very fine, transparent, white silk and printed my images rather than embroidered. I built my patterns by manipulating the fabric, cutting up images, and by layering the repeats through printed and painted dye, and by adding and subtracting color. I am drawn to and fascinated by all aspects of textiles. I have learned about history, other cultures, design, and myself, by studying and working with textiles. The processes of spinning, dyeing and weaving continue to bring me joy and satisfaction. I believe the fiber field has many facets, is ancient, and is anchored to our most intimate life.